Class is done! We've learned all the lessons from the book we can, so now we're prepping for our baby boards. As I've mentioned, these are practice practical board exams. We'll also be allowed to take tests called "The Hundreds", which are tests of 100 or so questions based off the real exam. We're allowed to take as many of these as we'd like in order to prep for the exams. While we gear up for that, we're continuing practicing on real clients. Last week, I had three full sets of acrylics on real clients (not students or friends). The first set here is a set I did on a 16-year-old client. She was a walk in Thursday night, and I accepted the challenge. Her sister was getting married on Saturday, and she was the maid of honor. 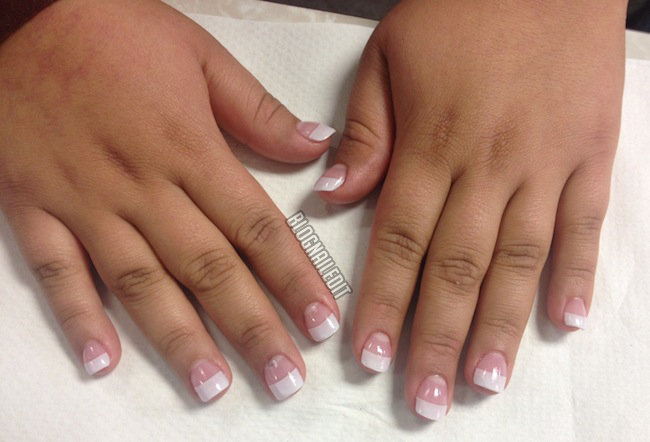 She wanted a full set of a basic French, and wanted them short and manageable. As you can see in her "before", she had really short nails to begin with, so keeping them relatively short was essential to a normal look. See her "after" following the jump! My second acrylic client came in on Saturday. Lo and behold...it's the bride! So that added an incredible amount of pressure for me, but we were still able to give her something she loved. She had really short nails as well (forgot to take the before picture), but wanted her's to be longer than her sister's. 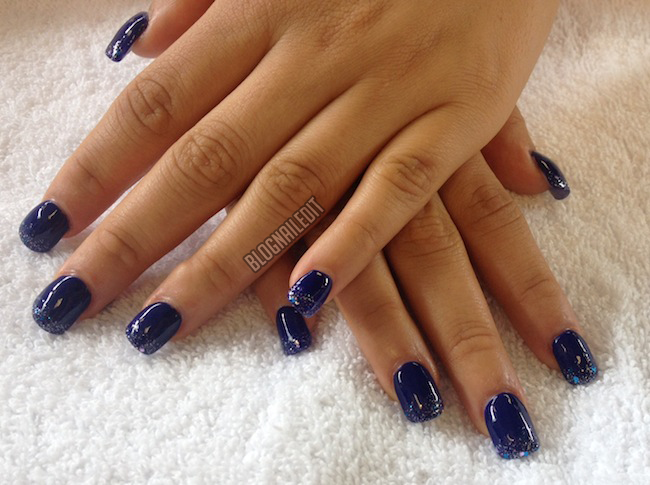 She also wanted some nail art, and ultimately decided on a blue polish with a glitter tip. The blue is OPI OPI...Eurso Euro. This was by far my best set yet. Very smooth and even, and it only ran about 20 minutes longer than planned. My final acrylic client was no newbie to acrylics. She showed me pictures of her nails before, and said she usually gets them done by a nail artist in Denver. I don't remember her name, but she did amazing 3D work, and I hope I'm able to meet her one day. Maybe this Thursday, when I attend Nail Talk Denver, a nail networking event IN DENVER! Shocking! 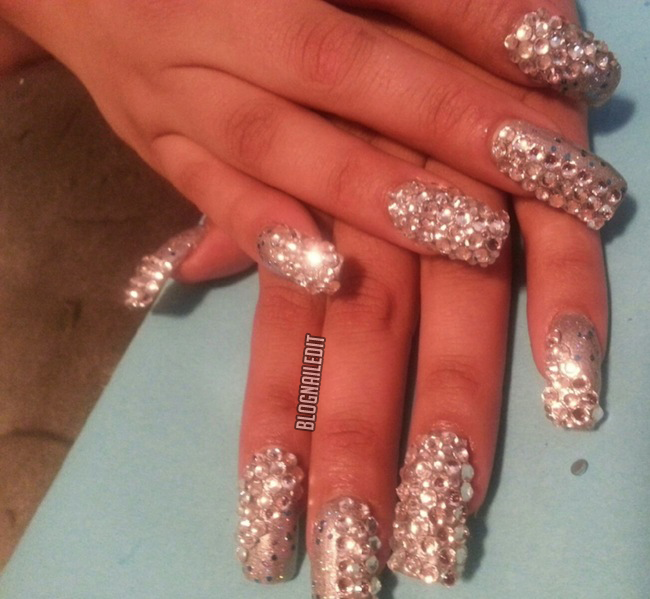 So the client wanted long acrylics with tons of bling. Unfortunately, her appointment ran long, as long acrylics naturally take more time to apply, and the gluing of all the rhinestones was time consuming. By the end, I couldn't give her all the rhinestones she wanted, and this was the final result. All these ladies were fun to work with, and I feel way more comfortable with acrylic than when I started. It's incredibly draining though, and the fumes gave me a headache by the end. Are there any readers who are nail tech students or nail techs? If you live close enough to Denver, come to Nail Talk Denver on Thursday night! I'll be there, and I'd love to share cocktails and network with you! I love the bling! Great job!